Every year a team of compassionate business men and women from the area work together to host an event specifically for our aging population. The Expo for Seniors brings together seniors, local experts, and local businesses to discuss important topics facing our aging population. What is the purpose of the Senior Expo? Sue: The purpose of this event is to create a way for seniors and their adult children to have access to over a hundred providers of senior care services. We want to make it more than just an informational day with area businesses. We also bring in a musician/entertainment and a keynote speaker to entertain and inspire the attendees. Sue: We design the event each year for seniors and their adult children, but it is beneficial to anyone who works with the senior population or even anyone who has grandparents or aging parents. As people age, they usually don’t seek out information or resources until they need it. If they wait that long, they begin scrambling to find answers. This event is perfect for people to come to as a way to learn about the aging process, even if they don’t have a current need. And it’s free! What can attendees expect to gain from the event? Sue: Each year is a little different, but this year attendees can expect to gain a better understanding of dementia. The committee agreed that choosing dementia as a theme could not have come sooner, as more and more families are facing this diagnosis. Not only is it prevalent, it is a very difficult diagnosis. It is difficult for individuals and families living with dementia, and we wanted to help provide a system of support for them. It is also important to create awareness to the general population to prepare them for interactions with dementia patients. Attendees will have the opportunity to speak to over 100 different vendors, read related articles in our expo magazine, and hear first-hand how Kim Campbell cared for her husband, Glen Campbell, once he was diagnosed with Alzheimer’s. Speaking of Kim Campbell, why was she chosen to be the keynote speaker? Sue: As a committee, we thought Kim would be a great fit as a keynote because she’s been there. Her experience with Alzheimer’s provides a way for the attendees to relate to her—to know they aren’t alone in their struggles. The way in which her family walked through the struggles is a lesson in and of itself—they were able to remain joyful during one of the most difficult seasons of their lives. Is is sure to be an inspiring presentation! Why is an event like this needed in this community? Sue: We are in a time when the baby boomers are aging. As a community, it is critical to interact with the topics associated with aging in order to be knowledgeable and understanding of what people are going through as they age. This year, we believe it’s important for our community to be more aware of dementia and its impact on our aging population. It will make us a better community as a whole to understand this disease. In healthcare, a lot of acronyms are used and it can sometimes get confusing. 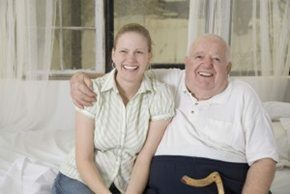 One of those acronyms, PCA, can truly help you and your family member stay in their own home! PCA stands for personal care assistant. A PCA is someone who helps people with day-to-day activities in their home and around their community. It can range from helping with personal care, or with homemaking and errand type activities. The people a personal care assistant helps can range from people living with physical or mental disabilities or simply those who are elderly and unable to do certain tasks by themselves anymore. What Can A PCA Do For My Family? One option to receive PCA services is through waiver services. Waiver services allow a personal care assistant to provide homemaking, chore and respite care to an individual. Waiver services are made available through your local county social services agency. The person who is to be cared for needs to be eligible for medical assistance to be eligible for waiver services. Another option to receive PCA care is through an alternative care program. An alternative care program allows a personal care assistant to provide services similar to waiver services. An alternative care program is made available through your local county social services agency. The person who is to be cared for needs to meet income and asset guidelines. To learn more about what a personal care assistant can do in your particular situation, contact us at Arise Cares today!